Correct diagnosis is important for providing exact treatment for a disease. For some ailments it is not possible to find out the diseases by the symptoms alone. Radiography is used to diagnose the ailment and diseases of the internal and hidden parts of the body using X-ray, Fluoroscopy, Ultrasound (sonography), CTscan (Computer Tomography), MRI (Magnetic Resonance Imaging), Angiography, PET (Positron Emission Tomography) etc. PET is a nuclear medicine medical imaging, a branch of medicine and medical imaging that uses unsealed radioactive substances in diagnosis and therapy, which produces a three dimensional image of the functional processes in the body. Unless we get a detailed image of internal body parts and what is happening in the body the treatment will not be effective. Radiography is concerned with operating radio imaging machines such as X-ray and interpreting results. It also involves treatment of cancers and tumors with radiation. 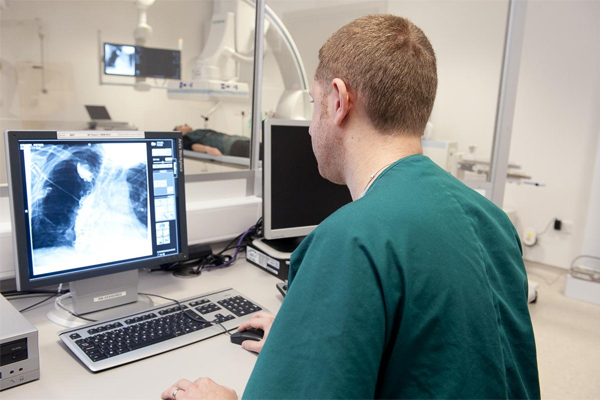 There are two career choices in the field- Diagnostic Radiography and Therapeutic Radiography. The responsibility of a Diagnostic radiographer is to explain the procedure to the patients, prepare them for the tests and operate the machine, and do the maintenance of equipment and records. They also assist physicians in performing procedures such as Myelograms (an exam to detect injuries, Cysts or tumours in the spinal cord) and surgeons in the operating room with portable x-ray machines or fluoroscopic machines. Therapeutic radiography or Radiotherapy is now being used in the treatment and diagnosis of a large number of diseases, including cancer, tumors and ulcers. A therapy radiographer use radiation in highly controlled conditions in the treatment of tumor. Exact amount of radiation will shrink the tumour. The need for professionals in the field of radiography is increasing. A radiographer (also called Radiologic technologist) have to handle the equipments and upgrade their skills now and then as technology advances. As more sophisticated newer machines are coming up and experts in this career is less, there is an increase in the need for radiographers.